The ultimate guide to Tomamu ski holidays in 2019 & 2020. Located in central Hokkaido (the island at the very north end of Japan), Tomamu is recognisable by its teetering hotel towers. The facilities in this resort - officially called Hoshino Resort Tomamu - are fabulous: there’s the small but growing set of all-singing, all-dancing hotels (Club Med’s one of the latest on the scene), top-notch restaurants and unique attractions like an indoor beach and outdoor Ice Village. Pretty much everything is ski-in, ski out (hotels, shops and restaurants included) and the fact that Tomamu is only a ninety minute drive from New Chitoise Airport is another big draw. New Chitoise has direct flights from airports across Japan and Asia for easy connections and opportunities for a multi-centre break. A gondola and five ski lifts serve the ski area, which at 21.3km isn’t the biggest on earth but still packs in variety across Tomamu Mountain and the Tower Mountain Area. Find ski schools and hire shops at the gondola station. The fact that off-piste skiing and snowboarding is allowed (in a strictly controlled ‘Powder Area’ with recommended routes) sets this place apart from a lot of other ski resorts in Japan. If you want to explore other Hokkaido ski resorts during your time here, Sahoro is 30 minutes’ drive away and you can reach Furano by car in just over an hour. When it comes to lessons, the GAO Snow Academy provide local lessons in English and some hotels have their own ski schools. First slides on skis usually take place on the Tower Mountain half of the ski area, where the easiest piste is the Hello Nipo, a 700m run served by its own chair lift and just for first-timers. Once you’ve conquered it, take a detour about a quarter of the way down onto the Pine Road piste, which links to Fairy Woods to return back to base. For access to the resort centre and Club Med resort, beginners can take the Tower Express and ski the Sunshine and Road to Gondola Runs over to the other side of the ski area. For a confidence boosting end of week route, ski the resorts longest run from the top of the ski area – the 3.3km Silver Bell. Last time we checked, blue runs (or ‘courses’ as they’re called locally) represented intermediate terrain here, and let skiers and snowboarders roam all over the ski area. We love the scenic ‘Ridge’ runs at the top of Tomamu – soak up the view of the snowy forest then take Dragon Ridge followed by Highway Coaster or Exhibition… Or Panorama Ridge, Silky Way and Silver Bell for a cruiser route down. Over on the Tower Mountain side, the Bird Watcher runs are short and sweet with ungroomed Venus as a fun route back to the centre. The resorts steepest course at 35 degrees is No Gravity, which, jutting down from Panorama Ridge is also the longest black graded run in the area at 770m. But this and the four other back runs aren’t your lot when it comes to expert level terrain – you can sign up for access to a separate powder area in the Resort Centre (the building with the triangle roof), where they’ll fill you in on safety rules, make sure you’re properly kitted out then give you the key to delicious off piste terrain – we like the routes off the ridge of Tower Mountain which take you through snow fields and forest. The beginner-friendly Hello Nipo, Forest Caster and Sunshine, intermediate-level Gemini and Moonshine and expert-only Freeway runs are usually open for night skiing. Like a lot of Japan’s ski resorts, there isn’t a big nightlife scene here in Tomamu – most people stick to their hotel’s bar and mealtimes take the main focus. Hokkaido’s food is famously fresh, with produce from potatoes to seafood making this the nation’s ‘breadbasket’. Experience it in the twenty something restaurants around the resort, from café’s and casual eateries to more formal dining rooms. You’ll find a lot of them on ski in/ski out Hotalu street – try the ramen at Afuri, Kobu Kuro steak at the Camaro Diner or pasta and raclette at Altezza. For sweet treats, Yukino is known for its Coupes (tubes of fruity, sugary goodness) and Moo Moo Cheese Cake. There’s so much to do the resort is often likened to a snowy Disneyland… We love the range of activities on offer, from the usual suspects of snowmobiling and sledding to snow banana boats and snow rafting… With snow shoe and cross-country taster sessions to boot, you can’t run out of ways to experience Hokkaido’s powdery snow. A winter wonder we hope they’ll keep for many years to come is the Ice Village, where you can order drinks from an ice bar, enjoy fondue in an ice restaurant and get stuck into other icy activities. Almost another world entirely, Mina-Mina beach is an indoor beach with tropical climes and a huge wave pool. While the tower hotels are unmissable, an architectural gem worth seeking out is the Chapel on the Water, built by Japanese legend Tadao Ando. When is the best time to ski Tomamu? On an average ski season, this place will see a whopping 14 metres of snowfall (think a double decker bus on top of a three storey house…). Often it starts falling in November, with runs staying open from December through to April. Layering up is recommended - it gets cold in this neck of the woods – though the set-up of the resort means you don’t have to spend too much time outside when off the slopes. Most of the slopes are south facing, capturing the best of the sunshine which is super in early winter but may mean you’re skiing slushier snow as spring approaches. Thankfully the long list of activities and attractions means there’s never a dull moment even in the unlikely event that the ski area’s off limits. A lot goes into making Christmas in Tomamu spectacular, with a record of excellent snow, wonderland attractions like the Ice Village (eyes peeled for Santa!) and activities including wreath and cookie making. Celebrate the New Year in Tomamu with hotel festivities, awesome Hokkaido cuisine and top notch powder snow. There’s so much for families here, which makes spending Half Term in Tomamu an excellent choice – ski all kinds of runs, go banana boating and snow rafting and relax in excellent hotels on a brilliant week away. Opt for Easter in Tomamu for something completely different. Springtime in Japan is spectacular, and even if the snow turns slushy later in the day, you’ll struggle to find a Japanese resort with more activities. 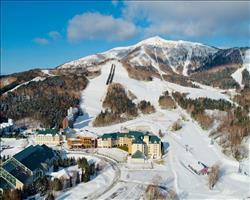 Tomamu’s one of our favourite ski resorts in Japan when it comes to family holidays. Being just an hour and a half’s drive from New Chitose Airport keeps boredom at bay, and there’s always the option to take the scenic rail transfer to make the journey even more exciting. Once here, English speaking ski schools like the GAO Snow Academy provide kids group lessons in classes of 3-6 year olds and 7-12 year olds, and private lessons for tots aged 4 and upwards. The gently progressive nature of the pistes is perfect for learners, while more experienced family members head off to explore both halves of the ski area. There’s a ton to keep time off the slopes exciting – a trip to the ice village will delight whether you’re a family of Frozen fans or not, with an ice slide for youngsters and a bar for grown-ups. You can all hit the beach in Mina-Mina, and have a whale of a time in the wave pool, kids pool and outdoor pool. Tomamu might be a smallish ski resort, but its mountain of activities makes it marvellous for groups. The ski area has a good amount for each level of skier and snowboarder, from the gentle Tower Mountain trails to steep, ungroomed black runs like No Gravity and accessible off-piste terrain. This is a top resort for groups with non-skiers, as the list of things to do is almost endless. Visit the Chapel on the Water and Ice Village, set off on a snowshoe hike, enjoy tropical climes at Mina-Mina Beach or stay put and sample your hotel’s facilities. When it comes to fun group activities, snowmobiling and snow rafting are great fun, as are evening snow cruises from the GAO Outdoor Center. All-inclusive hotels work brilliantly for groups with a range of tastes and appetites – with international buffets everyone can help themselves to whatever they fancy. And if you fancy a meal out there’s all sorts of choice, whether the consensus is for sandwiches, noodles, steak or pasta.